EPISODE SIX WITH MARKEIA MCCARTY! 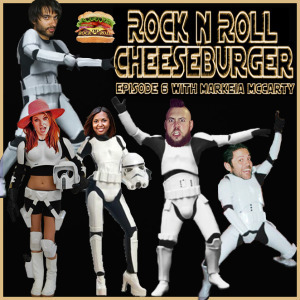 Markeia McCarty joins the cast for episode 6 of Rock N Roll Cheeseburger! Rock N Roll Cheeseburger Episode Six! Markeia McCarty gets burgery wit it for our sixth episode, while we spitball on these pressing issues in society & more: Garbage Pizza, Dogmatics vs. Second Guessers, Street Harassment, and Every Band Has At Least One Good Song? We also hear a word from this week’s fake sponsor, the Langley Swap Meet, and we hear another original comedy sketch with our Star Wars parody The Droids We Were Looking For. We hear some killer rock tunes in ep. 6 with “Audhumbla” by Monolord and “Blue Benz” by The Big Surprise. Strap in and press play, as we exude the force of the burger rock. Check out Markeia McCarty on Twitter, and on AfterBuzzTV.com.